How hard can garage organizing be? 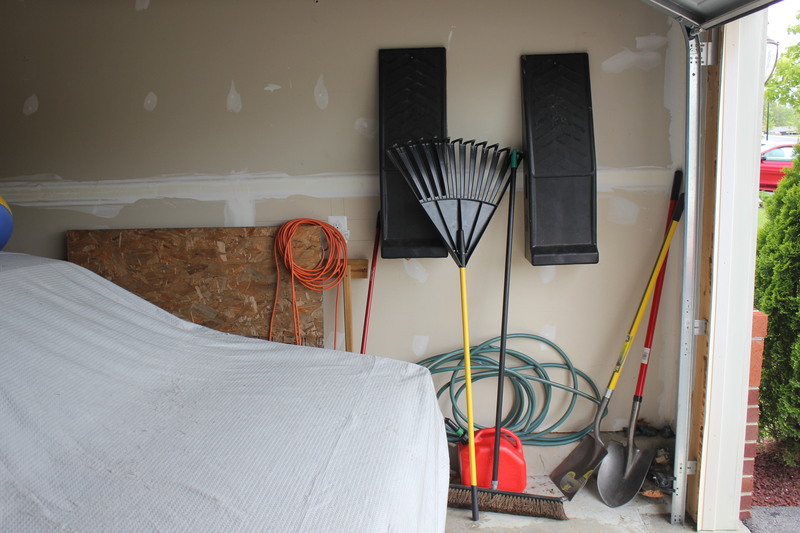 After 3 years in our newly constructed, custom-built home; new furniture throughout; new appliances; new paver patio and barbeque, a full wet bar in the finished basement with a pool table and 73 inch HDTV, there was still one area that needed my attention – the garage! 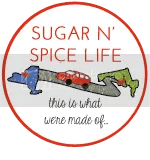 The garage is “my area.” It’s a place to ‘fix things’ and work on my Mom’s 1967 Mercury Cougar. It’s a place to assemble the kid’s toys and bicycles. It’s a place to simply get away now and then…to just tinker! But all of those things are tough when the garage is filled with boxes, mowers and garden tools, hoses and extension cords. 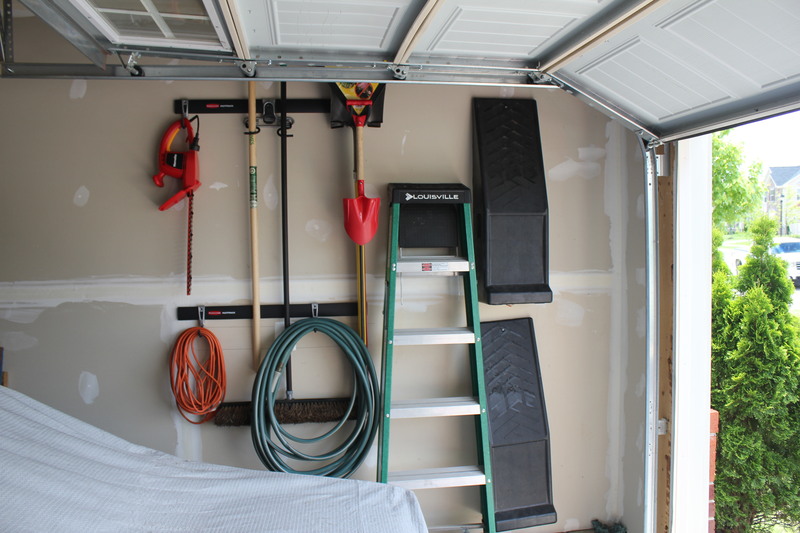 I needed a useable, clean, organized garage!!! But where would I start on such a seemingly impossible task? How about just this one corner! 😉 Thanks to the Rubbermaid FastTrack (Garage Organization System) 5 piece Kit, I had an easy solution! Target sells this system in stores for $33.99 and our local store had it in stock. 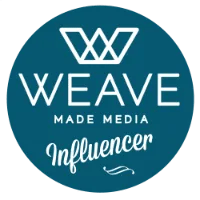 I found it in the Utility Organization aisle along with several other accessories and extra rails you can purchase separately to expand your storage possibilities. The 5 piece kit comes with one 32-inch rail, one multi-purpose hook, two scoop hooks, and one handle hook. 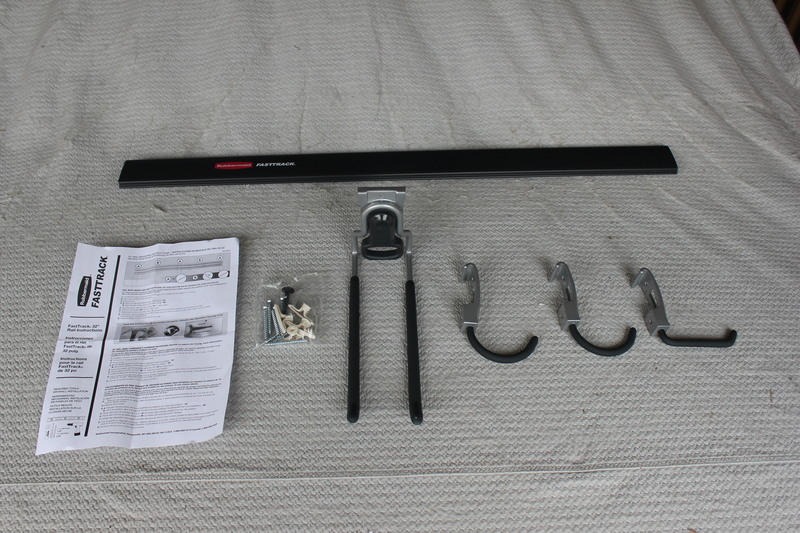 It also comes with the mounting hardware and simple, detailed mounting instructions. 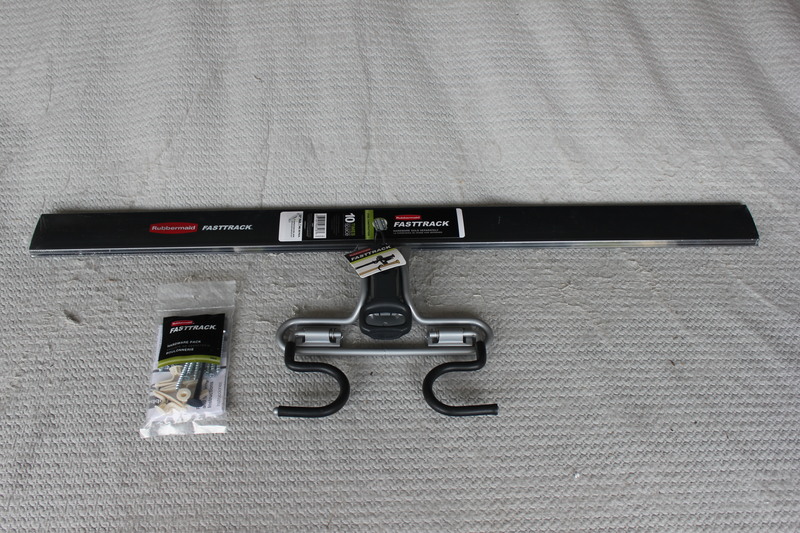 I saw another optional 2-handle hook that I thought would be great for the brooms so I grabbed one of those and an extra 32-inch rail as well, along with the necessary mounting hardware. 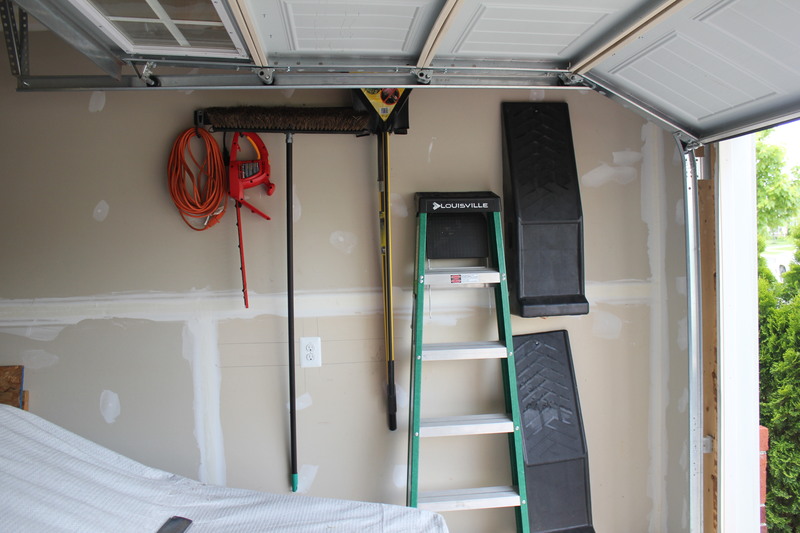 I followed the instructions and mounted the Rubbermaid FastTrack (Garage Organization System) 5 Piece Kit first to see how much work it would be, and how much it could hold. It went up effortlessly and I was done in just a few minutes. It easily held two shovels, a rake, a hedge trimmer, an extension cord, a garden hose, and a push broom. I was fairly impressed with the easy installation and how little room it took to hold all of those things neatly. But since I bought an additional 32-inch rail and the 2-handle hook, I went ahead and mounted that below the first rail. I moved the hooks around a bit – really easy to do and they lock in place great – until I was happy with the arrangement. Knowing that I can buy more hooks and even wire baskets, I am sure I will be adding to the rails soon! 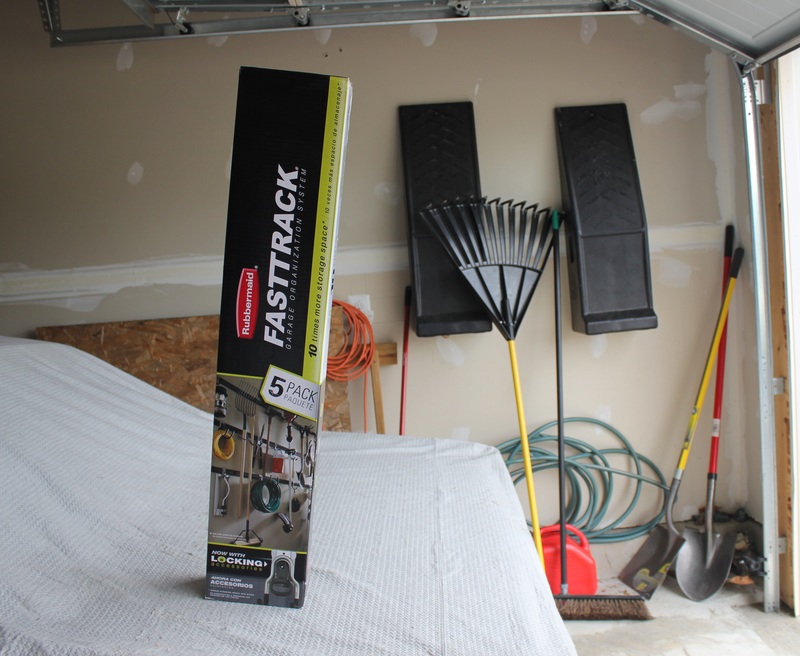 I highly recommend the Rubbermaid FastTrack (Garage Organization System) 5 Piece Kit to get you started on organizing your garage. Do you need a little incentive to jump-start your garage organizing? If so, you can benefit from Target’s in-store only discounted price of $28.89 (reg. $33.99) from May 18 – May 24, 2014, so head there right after work and get your own organizing project started!